Chronic kidney disease (CKD) affects an estimated 1% to 3% of all cats.1 This important cause of mortality in cats develops over a period of months or years. The associated nephron damage is progressive and irreversible even though some cats with CKD have stable serum creatinine concentrations for months to years. is solid evidence that dietary treatments, and increasing evidence that antiproteinuric treatments, can slow the progression of CKD. The cause of feline CKD is usually difficult to determine. 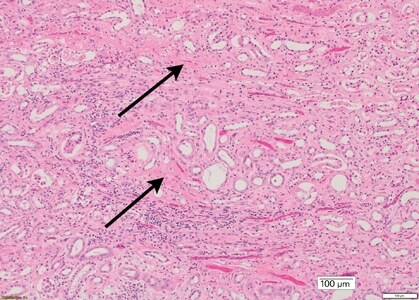 Due to the interdependence of the nephron’s vascular and tubular components, the end point of irreversible glomerular or tubular damage is the same: fibrous scar tissue replacement of nephrons (Figure 1). FIGURE 1. 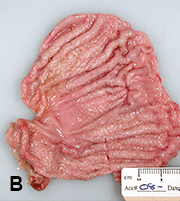 Histopathologic image from a feline kidney with CKD. Note the fibrous scar tissue replacement (arrows); and mononuclear cell infiltrates. Renal diseases associated with development of feline CKD are listed in Table 1.6 Progressive diseases that slowly destroy nephrons allow intact nephrons to undergo compensatory hypertrophy, which can delay onset of renal failure. Therefore, when renal failure occurs (< 25% of the original nephrons functional), nephron hypertrophy can no longer maintain adequate renal function. For example, 80% nephron loss may result in a serum creatinine concentration of 2 mg/dL. With progression, serum creatinine concentration should be approximately 4 mg/dL when 90% nephron loss has occurred. At the onset of International Renal Interest Society (IRIS) Stage 4 CKD (serum creatinine concentration > 5 mg/dL; Table 2), it is likely cats have < 10% of their original nephron population. These figures emphasize the need for early diagnosis and intervention. Pathophysiology of CKD can be considered at both the organ and systemic level. 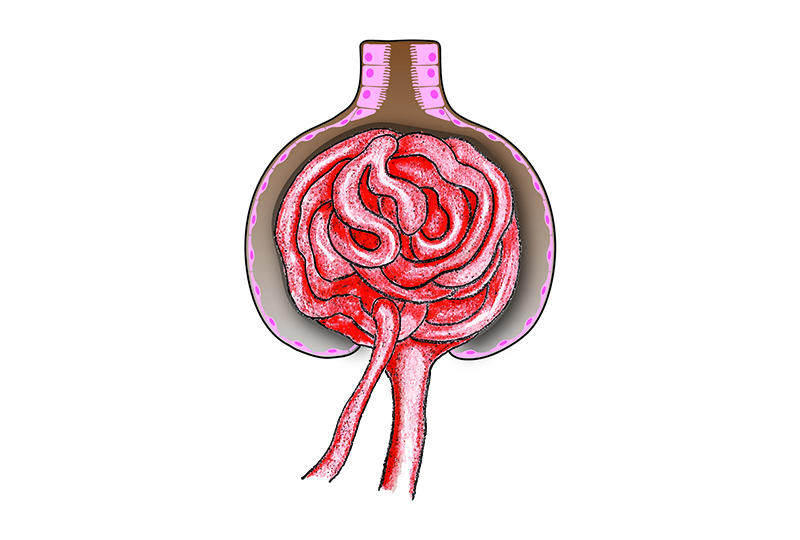 At the level of the kidney, the fundamental abnormality is loss of nephrons and decreased glomerular filtration. Reduced glomerular filtration results in increased plasma concentrations of substances that are normally eliminated from the body by renal excretion. In addition to excreting metabolic wastes and maintaining fluid and electrolyte balance, the kidneys function as endocrine organs and catabolize several peptide hormones. Therefore, hormonal disturbances are part of the pathogenesis of multisystem disorders associated with CKD. For example, decreased production of erythropoietin contributes to the nonregenerative anemia of CKD, and decreased metabolism and excretion of parathyroid hormone contributes to osteodystrophy. Finally, part of the pathophysiology of CKD is brought about by compensatory mechanisms. The individual glomerular filtration rate (GFR) of intact nephrons increases in an attempt to maintain adequate renal function; however, proteinuria and glomerulosclerosis may be consequences or “trade-offs” of this hyperfiltration (Figure 2). In CKD autoregulation of renal blood flow is lost, and single nephron GFR increases in proportion to the number of nephrons lost. The resulting increased intraglomerular pressure damages the glomerular capillary wall and increases plasma protein filtration, leading to subsequent glomerular and tubulointerstitial damage. Many different terms have been used to describe renal disease and decreased renal function, and unfortunately, these terms can be confusing due to lack of standard definitions and application. Kidney Disease or Renal Failure: Which Term to Use? The term chronic kidney disease is preferred to chronic renal failure because CKD can exist without renal failure and clients often feel discouraged when a diagnosis includes the term “failure.” Renal failure—defined by persistent renal azotemia superimposed on the inability to concentrate urine—results when 75% or more of the nephrons of both kidneys are not functioning. The IRIS (iris-kidney.com) was created to advance the scientific understanding of kidney disease in small animals and, specifically, to help practitioners better diagnose, understand, and treat canine and feline renal disease. Link appropriate diagnostic and therapeutic efforts to patients with varying degrees of CKD. The staging system outlined in Table 2 is not used until the presence of CKD has been confirmed. This system, which categorizes kidney disease into one of 4 stages, is based on serum creatinine concentrations in well-hydrated cats with stable CKD; stability is documented by < 20% variation in serum creatinine concentrations over a minimum 2-week period. Note that this staging system suggests that azotemia in cats begins with serum creatinine concentrations of 1.6 mg/dL or greater. However, serum creatinine concentrations must always be interpreted in light of the patient’s muscle mass, urine specific gravity (USG), and physical examination findings in order to rule out pre- and postrenal causes of azotemia. This staging system cannot be applied to patients with pre- or postrenal azotemia or those with acute or acute-on-chronic kidney disease. Glomerular or tubular in origin (ie, excessive filtration, decreased tubular reabsorption, or both). Urinary protein-to-creatinine ratios > 2 suggest glomerular-range proteinuria, which is rare in cats compared with dogs.7 It is important to recognize that this ratio does not differentiate renal proteinuria from proteinuria associated with lower urinary tract inflammation; the clinician needs to differentiate proteinuria by assessing urine sediment. Systolic blood pressure is typically measured by the Doppler method in cats. IRIS blood pressure substaging is based on risk for target organ damage (eyes, brain, heart, and kidneys). Most clinicians consider systolic hypertension to be systolic blood pressure > 160 mm Hg, and initiate treatment at that point. Clinical signs of CKD may not be present in early stages and, when present in later stages, are usually nonspecific, such as lethargy, weakness, anorexia, vomiting, and dehydration. Occasionally, uremic breath or oral ulcers may be observed.Unique signs of CKD (versus acute kidney injury) include a long standing history of weight loss and polydipsia/polyuria, poor body condition, small and irregular kidneys, and renal secondary hyperparathyroidism. 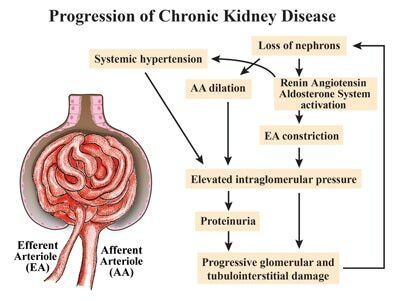 The classic diagnosis of renal failure based on renal azotemia (persistent azotemia superimposed on the inability to concentrate urine) pertains to CKD stages 2 through 4. Some cats with renal azotemia retain the ability to produce hypersthenuric urine (USG > 1.035) and, in these cases, response to fluid therapy helps diagnose prerenal versus renal azotemia. Increases in serum creatinine over time, even if the values remain in the normal range. For example, a serum creatinine concentration that increases from 0.6 to 1.2 mg/dL over several years could indicate at least a 50% reduction in GFR (at least 50% loss of nephrons because compensatory hypertrophy of remaining nephrons increases their functional capacity). Serum symmetric dimethylarginine (SDMA) is a new renal function marker that may aid in the early diagnosis of CKD in cats. In a recent longitudinal study of cats that developed CKD, SDMA concentrations increased above normal approximately 17 months before serum creatinine concentrations increased above the reference range (> 2.1 mg/dL).8 Of note, if a serum creatinine concentration of ≥ 1.6 mg/dL had been considered abnormal in this study, both serum creatinine and SDMA would have identified renal azotemia at nearly the same time. Monitoring may also include follow-up urine cultures and ultrasonography. Further definition of renal disease is most important in earlier stages of CKD when correction of the underlying disease or disease complication has the greatest potential to improve or stabilize renal function. Characterization of the disease stability is most important in earlier stages of CKD, when appropriate treatment has the greatest potential to stabilize renal function. Characterization of patient problems becomes more important in later stages of CKD, when clinical signs tend to be more severe. In this case, diagnostic (and subsequent therapeutic) efforts should be directed at patient problems, including anorexia, vomiting, dehydration, acidosis, potassium depletion, and anemia. Similar to the diagnostic approach to CKD (see Diagnostic Approach to Feline CKD), the therapeutic approach should be tailored to the patient’s disease stage (Table 5). For example, in the earlier stages of CKD, disease-specific treatments for nephroliths and bacterial pyelonephritis, as well as treatments designed to slow the progression of renal disease (renoprotective treatments), provide the most value. Renoprotective treatments include dietary change that reduces serum phosphorous concentrations9 and decreases soft tissue mineralization (Figure 3). In later stages of CKD, treatment tends to focus on limiting clinical signs associated with decreased renal function. FIGURE 3. 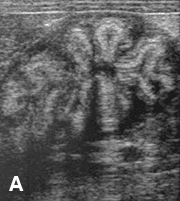 Ultrasound of the stomach of a cat with IRIS Stage 4 CKD demonstrating soft tissue mineralization (A). 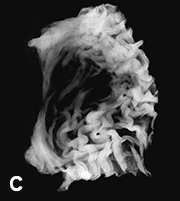 The cat was euthanized, and the gritty stomach tissue texture was observed at necropsy (B) and on a high-detail postmortem radiograph of the stomach (C). Soft tissue mineralization is most likely to occur in acid-secreting tissues, such as the stomach and kidney. Postrenal: Postrenal causes include obstructive uropathies—most commonly a nephrolith that migrates into a ureter (less commonly inflammatory debris or stricture), resulting in partial or complete obstruction. In a recent retrospective study, survival times were linked to the IRIS CKD staging system (Table 7).17 In Table 7, IRIS CKD Stage 2 was modified to Stage 2b, which included only cats with stable serum creatinine concentrations between 2.3 and 2.8 mg/dL. This change was made because the high end of the normal reference range for serum creatinine at the study center was 2.3 mg/dL; in other words, the investigators had no way to retrospectively identify cats with serum creatinine concentrations between 1.6 and 2.3 mg/dL. The remainder of the staging system used in this study correlated with standard IRIS stages. Notice the stepwise decline in survival as CKD stage increases: 1151 days for Stage 2b cats (which would be higher if all stage 2 cats had been included) versus 679 days for Stage 3 cats and 35 days for Stage 4 cats. This trend is not surprising, but the actual numbers facilitate better prognostication and emphasize early diagnosis. 1. Brown SA. Linking treatment to staging in chronic kidney disease. In August JR (ed): Consultations in Feline Internal Medicine. St. Louis: Elsevier Saunders, 2010, pp 475-482. 2. Polzin DJ, Osborne CA, Adams LG, Lulich JP. Medical management of feline chronic renal failure. In Kirk RW, Bonagura JD (eds): Kirk’s Current Veterinary Therapy XI. Philadelphia: Saunders, 1992, pp 848-853. 3. Ross SJ, Polzin DJ, Osborne CA. Clinical progression of early chronic renal failure and implications for management. In August JR (ed): Consultations in Feline Internal Medicine. St Louis: Elsevier Saunders, 2005, pp 389- 398. 4. Lulich JP, Osborne CA, O’Brien TD, et al. Feline renal failure: Questions, answers, questions. Compend Cont Educ Pract Vet 1992; 14:127-153. 5. White JD, Norris JM, Baral RM, et al. Naturally-occurring chronic renal disease in Australian cats: A prospective study of 184 cases. Aust Vet J 2006; 84:188-194. 6. DiBartola SP, Rutgers HC, Zack PM, Tarr MJ. Clinicopathologic findings associated with chronic renal disease in cats: 74 cases (1973-1984). JAVMA 1987; 190:1196-1202. 7. Lees GE, Brown SA, Elliott J, et al. Assessment and management of proteinuria in dogs and cats; 2004 ACVIM forum consensus statement (small animal). J Vet Intern Med 2005; 19:377-385. 8. Hall JE, Yerramilli M, Obare E, et al. Comparison of serum concentrations of symmetric dimethylarginine and creatinine as kidney function biomarkers in cats with chronic kidney disease. J Vet Intern Med 2014; 28:1676- 1683. 9. Polzin DJ, Osborne CA, Ross S, et al. Dietary management of feline chronic renal failure. Where are we now? In what direction are we headed? J Feline Med Surg 2000; 2:75-82. 10. Chakrabarti S, Syme HM, Elliott J. Clinicopathological variables predicting progression of azotemia in cats with chronic kidney disease. J Vet Intern Med 2012; 26:275- 281. 11. Jepson R, Brodbelt D, Vallance C, et al. Evaluation of predictors of the development of azotemia in cats. J Vet Intern Med 2009; 23:806- 813. 12. Syme HM, Markwell PJ, Pfeiffer D, et al. Survival of cats with naturally occurring chronic renal failure is related to severity of proteinuria. J Vet Intern Med 2006; 20:528-535. 13. King JN, Tasker S, Gunn-Moore DA, Strehlau G. Prognostic factors in cats with chronic kidney disease. J Vet Intern Med 2007; 21:906-916. 14. King JN, Gunn-Moore DA, Tasker S, et al. Tolerability and effi cacy of benazepril in cats with chronic kidney disease. J Vet Intern Med 2006; 20:1054-1064. 15. Mizutani H, Koyama H, Watanabe T, et al. Evaluation of the clinical effi cacy of benazepril in the treatment of chronic renal insufficiency in cats. J Vet Intern Med 2006; 20:1074-1079. 16. Jepson RE, Elliott J, Brodbelt D, Syme HM. Effect of control of systolic blood pressure on survival in cats with systemic hypertension. J Vet Intern Med 2007; 21:402-409. 17. Boyd LM, Langston C, Thompson K, et al. Survival in cats with naturally occurring chronic kidney disease (2000-2002). 2008; 22:1111-1117.